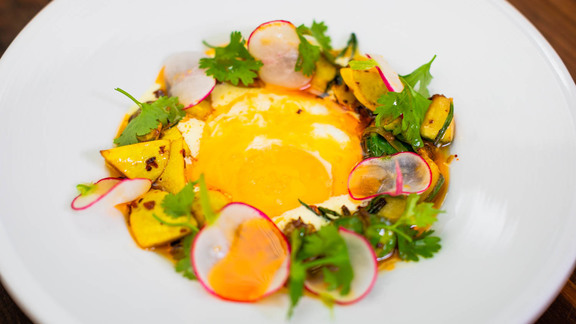 Want to up your egg game to match the rustic simplicity of Chef Broussard’s creation? Of course you do. Here’s how to do it, in a recipe brought to you in partnership with Eggland’s Best. 1. Custard: Blend together cotija cheese, milk, 50 g water, and eggs. Sous-vide at 176˚F in a pastry bag (or poach in hot water if you don’t have a circulator). Chill in ice water bath; blend until smooth. 2. Chorizo Vinaigrette: Heat oil in a skillet set over medium heat; cook chorizo until crisp and cooked through. Add sherry vinegar. Set aside. 3. Summer Vegetable Hash: Melt butter in a skillet set over medium-high heat; sauté green onion, squash and turnip for 3 to 5 minutes or until squash and turnip are cooked. Add garlic; cook for 1 minute. Add lemon juice, salt, and pepper. 4. Eggs: In a saucepan set over medium heat, poach eggs gently in brown butter, ensuring eggs are completely immersed in brown butter. 5. Spoon warm custard into the center of 4 plates. Place poached eggs on top of custard. Drizzle chorizo vinaigrette over eggs. Sprinkle with chopped herbs.